Augur is a Decentralized Prediction Market Platform, built on Blockchain technology. Prediction markets allow users to buy and sell shares in the outcome of an event. The current market price of a share is an estimate of the probability of an event occurring. 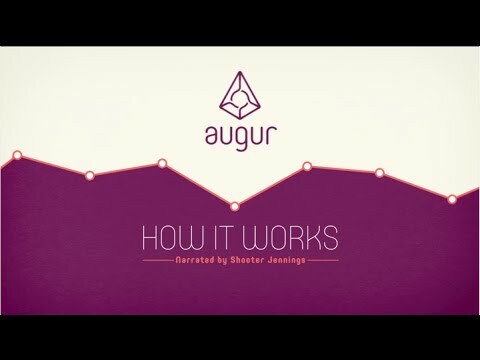 To gain this large audience, Augur is built on Ethereum, a decentralized blockchain network similar to the Bitcoin network. Utilizing this technology, our markets can effectively eliminate counterparty risk and centralized servers while creating a global market by employing cryptocurrencies such as bitcoin. Augur's prediction markets provide powerful predictive data - you can think of the current market price of any share in any market as an estimate of the probability of that outcome actually occurring in the real world. For example, a share priced at 64 cents has a 64% probability of happening. Team: Founder Jack Peterson has a PHD in Biophysics from the University of California. GUI developer Joey Krug followed in the footsteps of Vitalik Buterin as a Thiel Fellowship grant recipient, and Vitalik is actuallly an advisor to this project. Vision: Augur is among the most visionary of all ICOs. In fact it can be said that Augur (or a similar service) is absolutely necessary to the success of the blockchain industry itself. Blockchains currently have very limited "native" knowledge. Without outside help, blockchains know facts like the current time, the number of active wallets, the trading volume, etc. But a blockchain does not yet have access to facts such as: which countries most of its users are in, whether an item purchased with its native currency was actually delivered or not, or whether the value of its currency is going up or down. Augur’s vision is to provide a decentralized means to settle matters of fact external to a given blockchain, and then unfalsifiably feed that information into that blockchain. Product: While their vision is revolutionary and their product is absolutely indispensable, I have tested their GUI extensively and at the present moment the user interface simply doesn’t work. There are no problems navigating through the various pages and options, but whenever you click a button to interact with the blockchain, 70% of the time nothing happens. My MetaMask wallet appeared correctly, and displayed “transaction sent” messages, but the transactions were confirmed only about 30% of the time even with a high gas fee, and the unconfirmed transactions could not even be found on EtherScan.io, which means they were never even broadcast to the network. It seems like a simple problem to solve, but I still encounter this situation even after testing it for months. In conclusion, while EOS was the most successfully executed ICO, Augur remains the most useful and visionary service, at least on paper. As it stands I give the product a 3 out of 5. If they improve the user interface I will increase this to the 5.0 that Augur truly deserves. Sail the high seas of success.